The London Graduate School, Kingston University, presents a one day symposium on Rhythm & Event, Saturday 29 October 2011, King’s Anatomy Theatre and Museum. Can a concept of rhythm, understood as a vibrational, irregular, abstract-yet-real movement, lurking at the unknown dimensions of the event, bridge the gap between actual & virtual, analog & digital, spatial & temporal, as well as between theories & practices of sound? 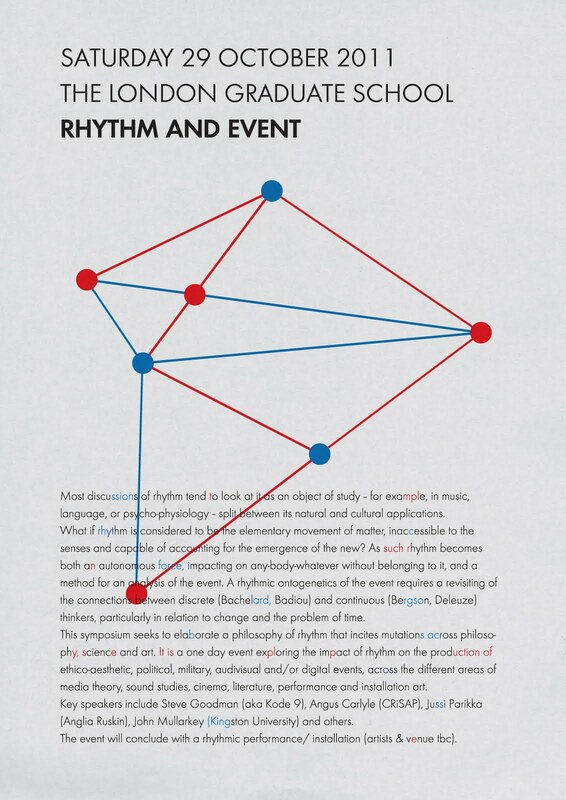 The purpose of this symposium is to elaborate a philosophy of rhythm as an appropriate mode of analysis of the event, and a method with which to account for the process of change and the production of novelty in contemporary environments. Plenary speakers include, Matthew Fuller (Goldsmiths College) & Andrew Goffey (Middlesex University), Angus Carlyle (LCC, CRiSAP), and Jussi Parikka (Winchester School of Art/ University of Southampton). The event will conclude with an electronic audiovisual performance and wine reception. Despite the insistence on the objective materiality as a grounding for technical media culture, a key realization that framed also technical media was that of rhythm – or more widely vibrations, waves, rhythms, and patterns. From the 19th century discoveries concerning Hertzian waves and Fourier transformations, Helmholtz and Nikola Tesla to mid 20th century research into brains and brain waves mapped and modulated through EEG (W.Grey Walter and the British Cybernetics), and onto contemporary digital culture of algo-rhythms (Miyazaki 2011), this talk maps a short genealogy of rhythmic technical media. The talk focuses especially on the epistemological mapping of sound words by the Institute for Algorhythmics (Berlin), and argues for an aesthetic-technical connection to think through the sonification of non-sensuous digital worlds. Referring to Wendy Chun’s (2011) ideas concerning the invisibility-visibility pairing in digital culture, the talk addresses not code, but rhythm as the constituting element for technical media.